I can’t believe it is almost time for Christmas. We have only just put up our Christmas tree. I thought “holiday tree” as I typed Christmas tree and pissed myself off. I hate when people call it a holiday tree. Like renaming it is going to fool a Muslim or Jew into having one. Just call a spade a spade, for crying out loud. 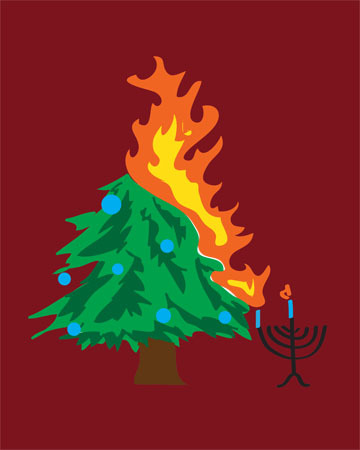 We don’t call menorahs “holiday candlesticks”. The Christmas tree is pretty depressing this year. It is the same three or four-foot tree I have had since college and reminds me a little of the pathetic tree in that Charlie Brown Christmas special. It was starting to look happier, once all of my pretty decorations were hung to mask its pain, but then the cats refused to leave the tree alone and broke one of my more treasured ornaments. I packed up all the other ornaments that were breakable [which was most of them] and the tree is back to looking depressed. I also have lots of on-line present shopping to do as Mr. W is the only person I have shopped for so far. His present is awesome, by the way. I just may be the best wife ever. My own Christmas list this year consists mainly of clothing items for work. My ten-year-old self would be so disappointed in me. But she probably just wants Barbies, so what does she know?